After an impressive £25 million refurbishment, it comes as no surprise that Scotland’s Haymarket station won the Large Station of the Year category at RAIL’s 2014 National Rail Awards. This busy station is the first stop west after leaving the Scottish capital’s main station - Edinburgh Waverley. Previously it may have been regarded as something of a poor relation to its neighbour, but not now. Passenger facilities are superb, in particular the concourse and footbridge - complete with escalators, lifts, shops and toilets. In fact, the concourse has tripled in size to 8,700sq metres, to cater for a predicted 125% increase in passenger numbers in the next 15 years. The revamped roof makes the station, which originally opened as Edinburgh’s first terminus in 1842, light and airy. And extra access, including a ‘rugby tunnel’, has been incorporated to cater for match days at nearby Murrayfield station. A new entrance makes access easier than ever, while new screens around the station switch between advertisements, real-time train running and weather information, according to events. A single large departures board means passengers can see at a glance when their train is due. 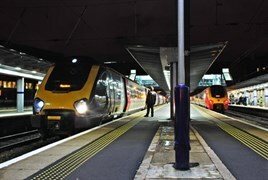 Its four platforms serve local, regional and long-distance trains, while onward journeys are made better than ever with an improved interchange between trains, buses and trams. And ScotRail’s friendly and helpful staff are always on hand to assist and inform passengers with advice and a smile - the final element in the success of this upgraded and well-managed station. The woman who leads Haymarket station is Customer Service Manager Helen Jarvis. A career railwaywoman, her face lights up when she discovers that former ScotRail Managing Director Chris Green was one of the judging panel. “He’s my hero. I have his autograph,” she beams. Green was known for his commitment to style and customer service, and that’s something that has clearly rubbed off on Jarvis. The first phase of the rebuild was completed on December 19 2013, and was opened the following day. “We had a primary school choir singing, and it was a delight,” she recalls. She points to the ‘cube’ hanging over the concourse, and which signposts to various parts of the station. “The signage was up, but things were missing. We didn’t tell people the obvious things. That time gave us the change to refine - to fine tune the station.” She says that when May this year arrived and phase two began, it enabled her team to concentrate on other areas. Jarvis particularly likes the roof, which she says “acts as a duvet” and allows the station to breathe in and out The footbridge is also now much wider, having been replaced over two weekends. She highlights how the work carried out at the station to improve the overall accessibility means that the mobility team at Transport Scotland has announced that their station of choice is Haymarket. This is another accolade for her to be proud of, she says. What does she think of the award? “You have no idea how happy I am. Words fail me. The pride is in my team. We all wanted it. We wanted to be the best, and we are. “I want everything electronic. I want electronic timetables. I have no clue about electronics - but I want them because they are the future and I believe in the future. We want to be the blueprint. We want to show the industry the way. We want to be the top of the delivery service.